Seldom venturing above ground, the beady eyes and small ears of the plains pocket gopher are reflective of their underground lifestyle. Running along one recent spring day, a flick of motion caught my eye. As I approached, the flicked item turned out to be dirt, and the flicker was a pocket gopher diligently undermining a good portion of someone’s lawn. Spring and fall these fossorial animals are busy doing what that they do best — burrowing. ("Fossor" is Latin for "digger" after all.) 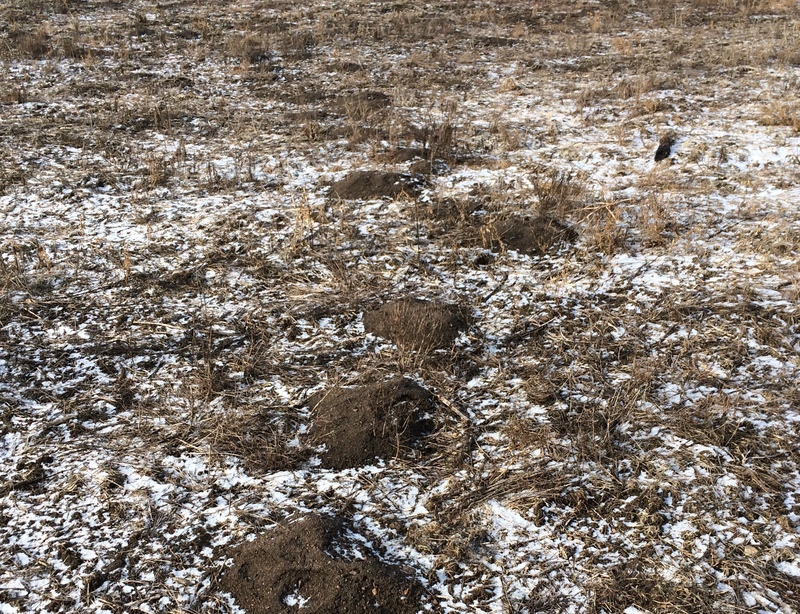 While some homeowners may not appreciate their industriousness, pocket gophers are vital to a healthy native prairie ecosystem, providing food, habitat and shelter for numerous species. One of two pocket gopher species in Minnesota, plains pocket gophers (Geomys bursarius) are chunky rodents, about 10-12 inches long. Although essentially solitary, they associate with others in loose colonies and are common throughout the state. (Their cousin, the Northern pocket gopher can only be found in the very northeast corner of the state.) Year-round they're active day and night, seldom leaving the extensive tunnel system. Their tunnels provide access to and storage of food, help protect them from predators, and make for a nice cozy place to raise their young. One litter of three to four young are born in the spring and are evicted from the nest by mid-summer. Pocket gopher mounds are easy to distinguish from other burrowing animals' because they don't have an opening, just a pile of soil. Plugged entries help temperatures and humidity levels remain steady in the burrow, helping the gophers avoid temperature stress. 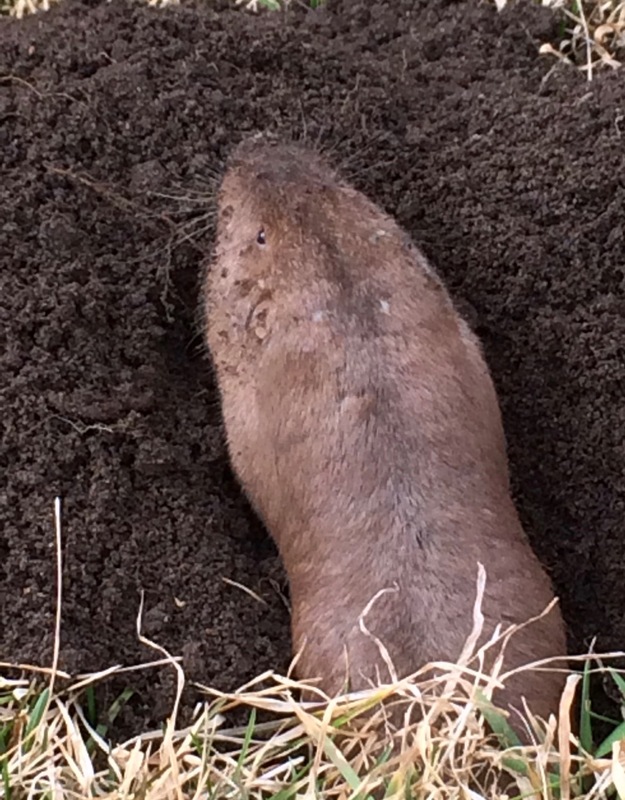 Most digging animals use their front claws to excavate, but not pocket gophers. Moles, for instance, have extra-large front feet and claws to rapidly burrow through the soil. Pocket gophers, however, use their large, protruding front teeth. While this would seem to make for an unpleasant mouthful, pocket gophers have the nifty ability to close their lips behind their teeth to keep the dirt out! Their teeth are also used to obtain food — mostly roots, tubers, and bulbs as well as stems of young plants — pulled into the burrow from below. In urban settings, the harvested food might be the roots of prized landscaping plants, making gophers unpopular with some homeowners. In their native range, however, pocket gophers are a very important and beneficial component of the ecosystem. Gopher tunnels aerate the soil which also improves water infiltration. Their waste fertilizes the soil and their abandoned tunnels provide habitat for numerous other species, including snakes, mice and various insects. Aboveground, the fresh mounds of soil provide new locations for plant dispersal. Plus the gophers themselves are prey for many snakes, badgers, fox, coyotes and raptors. So, what's in those pockets? Lastly, we can’t discuss pocket gophers without mentioning the feature for which they were named – their pockets! The large cheeks of these rodents are actually external, fur-lined pouches in which they transport bits of plant food that they forage underground. This is a feature common in other burrowing rodents, such a kangaroo rats, pocket mice and others. So "what’s it got in its pocketses" would hardly be the treasure Tolkien's Gollum was seeking in The Lord of the Rings! But much like Gollum, the pocket gopher is a creature of the underworld, where it plays a very important role. 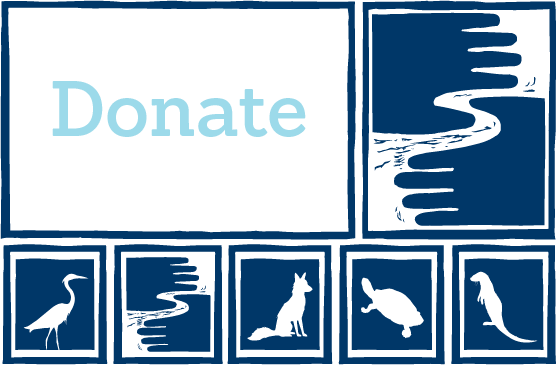 Learn more from Minnesota Seasons and the National Wildlife Federation.